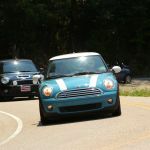 Sunshine MINIs • View topic - Calling Tallahassee MINIs! I have been driving MINIs over 10 years and living in Tally for about 4 and... well Tally is great and all except for the lack of MINI club. How many of you guys live in Tallahassee and would be interested in doing a monthly meet??? I drive a F53 Volcanic orange and my husband drives a yellow MINI Countryman.